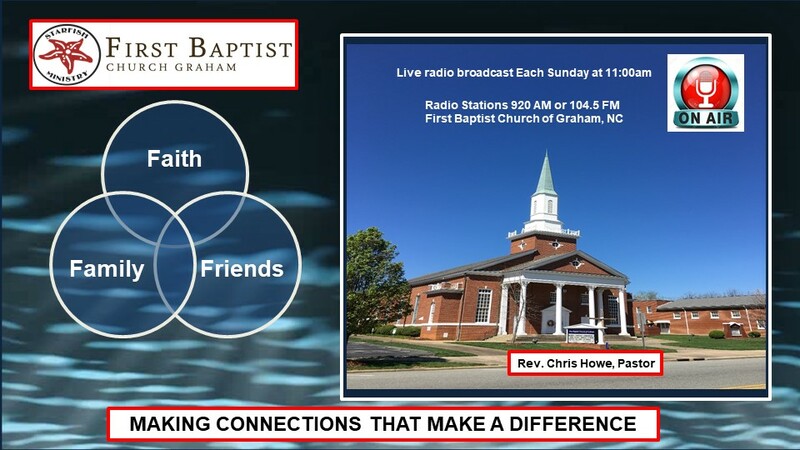 First Baptist Church of Graham, North Carolina would like to welcome you to our web site. We hope you find this web site useful, informative, spiritually rewarding and that it answers some of your questions about our church. At First Baptist we work to meet needs of people in every stage of life. From preschool ministries to senior adult activities. First Baptist has a place for everyone. First Baptist offers inspiring worship, meaningful Bible study, exceptional music, mission opportunities, and a fellowship of support. If you are looking for a community of faith where you can find a home, we invite you to join us at First Baptist. If you are thinking about visiting us, here are a few of the questions that you might have about where to go, what to do and what to expect. Where is First Baptist of Graham? During Sunday School there are greeters located in the chapel, where all classes meet at 9:45 am. Of course, if you cannot locate a greeter feel free to ask anyone that you see for directions. They will be glad to help. Don’t worry if you are late, there is usually someone roaming the halls during Sunday School. During worship, ushers are available in the vestibule. Please contact one to guide you and answer your questions. If you arrive late to Worship, it isn’t a problem. The ushers will help you find a seat at a convenient time. Should I visit both the worship service and Sunday School? You are welcome at both our Sunday School as well as our worship services. We have several different Sunday School classes to choose from take a look at our class directories to decide which one would be best suited for you. If you need help deciding which class is best for you, contact us at fbc@fbcgraham.org . We would love to hear from you. Some age groups have more that one class and we encourage our visitors to try them out to find the one that best fits their needs and interests. All classes meet in the chapel at 9:45 am and someone will be there to assist you if you decide to visit us. We provide a nursery for infants under three years old during Sunday School and the worship service. We have Sunday School classes for children that are older than this and we provide children’s church for ages three to five. Children can of course stay with their parents during church, but most children really enjoy children’s church. You can find out more about our activities for the younger children at our children’s education page. Are your sermons broadcast on the radio? Yes, our sermons are broadcast live every Sunday morning at 11:00am on Station 920-AM or 104.5-FM. We would love for you to visit us by means of our radio broadcast.